Bimini Island - Hello Great Hammerheads...or should I say, Hello Bull Sharks??? February 3, 2017 - Traveling to Bimini. We left Tiger Beach. That is always a sad time for me, because I hate leaving this amazing place. I have been traveling to Tiger Beach since 2003. I have seen the changes and the evolution of this amazing dive site. This spot is only 13 years old, not even old enough to drive a car yet. But it is hands down the World's greatest shark dive. We motored off as the sun was setting. The sunsets here are amazing as well. That is part of our ritual here at TB, dive all day, clean up and then drink something cold while watching the sunset. Nothing like saying goodbye to another day, just happy to be alive. Watching sunsets is easily one of my most favorite things in the world to do. They are always different, always beautiful and always perfect. We arrived at Bimini in the AM and we were treated with a great sunrise (more sappy stuff, I know. But I do love nature.). We were also greeted by 7 bull sharks. Damn, not exactly the sharks we were hoping to see. Bimini is a hot spot for great hammerheads and the last thing anyone wants is for other species of sharks to over whelm the place, which is exactly what is slowly happening with all the bulls and nurse sharks in the area. Sharks can be very territorial, especially bulls and will intimidate the other species from the area. 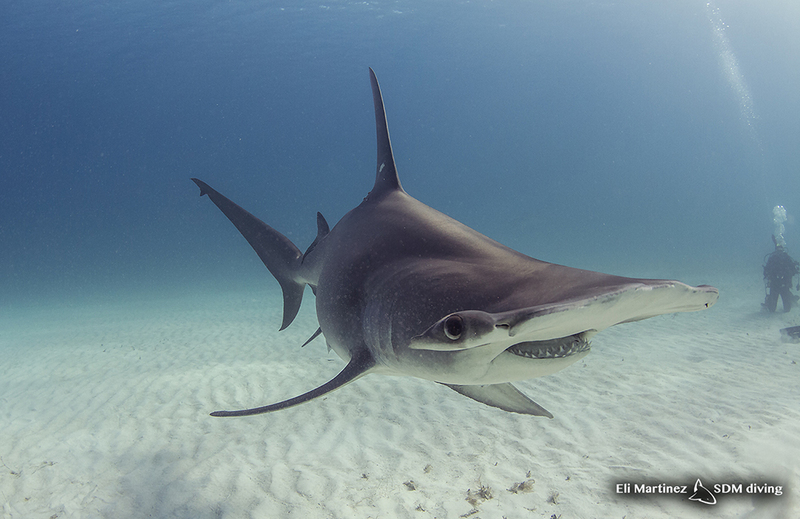 The larger great hammerheads are not so easily intimidated, but the smaller ones are. So we made certain not to feed or allow any scraps to get loose for the “other” sharks to eat. The currents were running the wrong way when we arrived and our chum scent was not going out into the deep water, which is where the great hammerheads are. So we spent quite a few hours waiting for the sharks to arrive. We finally got one hammerhead in. A big dark female named Epic. She stayed with us the rest of the day and everyone got images and video. They also got plenty of bull shark footage as well. A different species for our week, so yes that was great. We just do not want those sharks to get comfortable and ruin this dive. Bull sharks can easily be found in other places. Bimini is special and we all want to keep it that way. 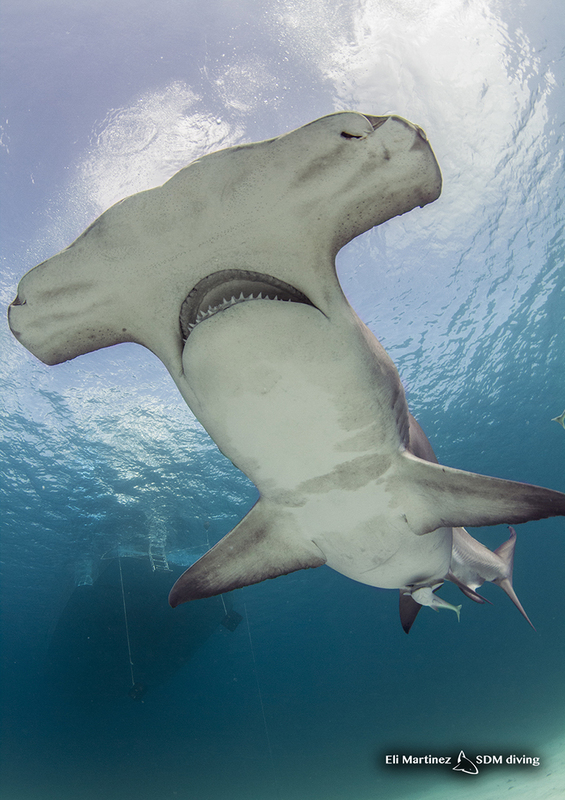 The following day, we woke up to an early surprise, a big great hammerhead named Hook Face. She stayed with us all morning. Along with the same seven bull sharks. We had a great morning with her. We also had two other great hammerheads try to come in. But before they could come in, the bulls would start their intimidation dance and the great hammerheads would leave. I helplessly watched them swim off. Those dirty gangsters won today. Frustrating, but it is what it is…that is nature, sometimes you get amazing crazy encounters and other times, you get bull sharks! Lol. 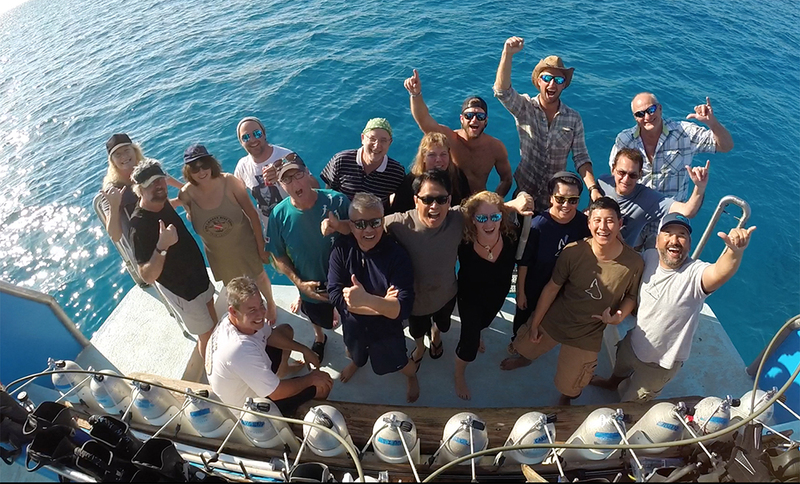 It was still an amazing trip with great shark encounters, amazing people and good times. Sadly our trip ended. I had to say goodbye to the Bahamas, our friends who joined us out there, and my beautiful sharks. I am headed home for a few days. I am excited about going home, because I miss my family, but sad that I am saying goodbye to these great sharks for the season, that are like my family as well. Thank you guys for reading an watching our Travel Vlogs. If you like what you read, please share it or subscribe to our channel for more adventures and videos. We will definitely be sharing more Notes from the Road for sure...as the adventures must continue… next travel blog report; grey whales off Baja, Mexico! Newer PostShark School - The new season of teaching kids about sharks begins! Older PostTiger Beach...Thank You Ocean Gods! Finally, we have beautiful weather.